After many years of wanting to, we finally installed some solar-powered pumps and livestock water tanks in our family prairie. (Thanks to the U.S. Fish and Wildlife Service and Nebraska Game and Parks for providing cost-share money!) Those two water tanks give the cattle nice cool clean water to drink and allow us more flexibility in the way we design our grazing each year. Most importantly, they allow us to exclude the pond/wetland from grazing so it can start to function as a wetland rather than as a big mud hole for cattle to stand around in. Because we’ve had good rains this year, the wetland has been pretty full. That’s nice, but it has also prevented much of the wetland-edge seed I planted from germinating and growing. Despite that, the recovery of the wetland is well underway. There is now grass growing right to the water’s edge and arrowhead and other emergent plants are starting to appear in shallow water. I’ve been spraying the few reed canarygrass plants growing nearby in the hope of preventing that invasive species from taking over the margins of the wetland, and hopefully I can get some more diverse wetland plants to establish there instead. 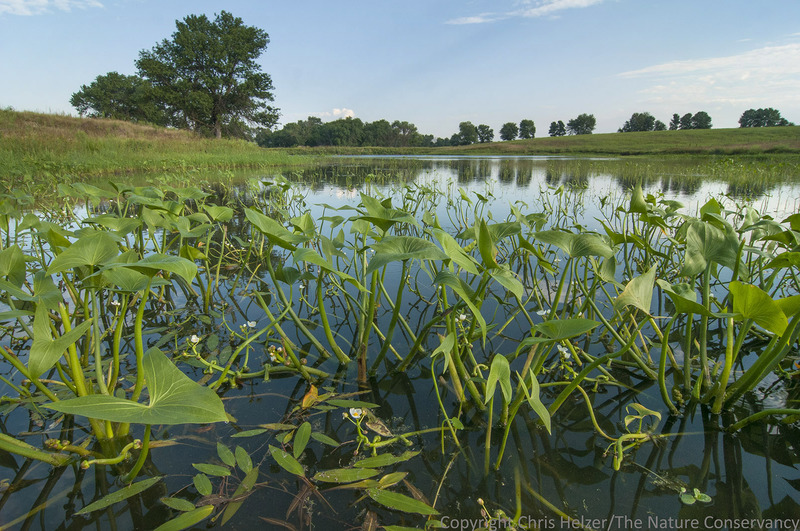 The pond/wetland at the Helzer family prairie with abundant arrowhead (Sagittaria sp.) in the shallows. My daughter and I went for a walk at the prairie over the weekend and visited the wetland to see what was happening. As I waded into the shallow water to take the above photo, leopard frogs scattered from my footsteps and red-winged blackbirds scolded me for encroaching upon their territories – very good signs of recovery. However, looking more closely at the arrowhead plants poking through the water, I found even more evidence of new life. 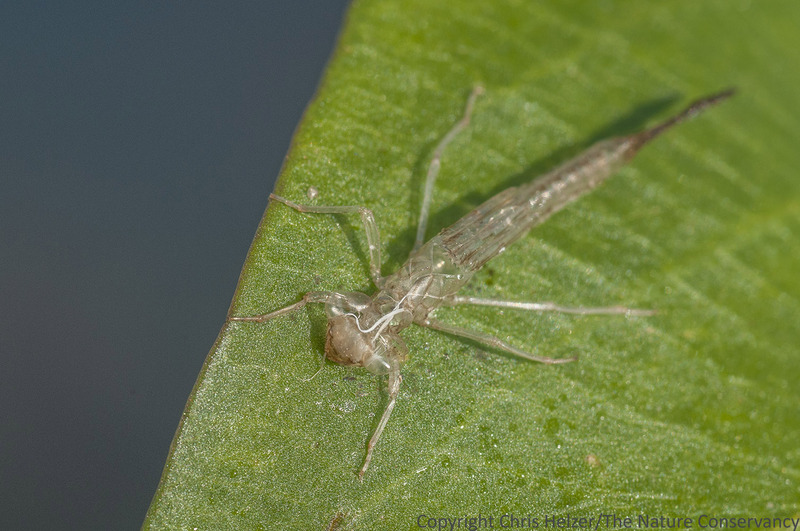 Abandoned exoskeletons of damselfly nymphs were littered around the wetland. 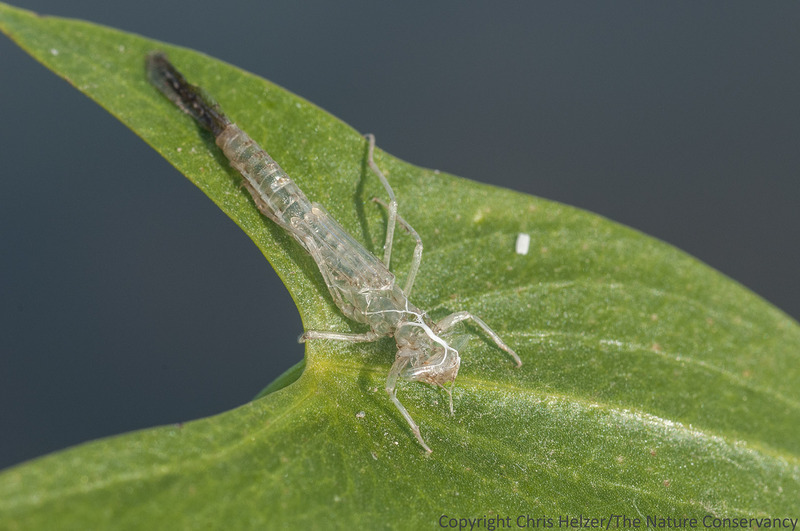 Adult damselflies fluttered around everywhere, and many of them had apparently just appeared on the scene because the larval exoskeletons they’d just emerged from were stuck to leaves and stems all over the place. 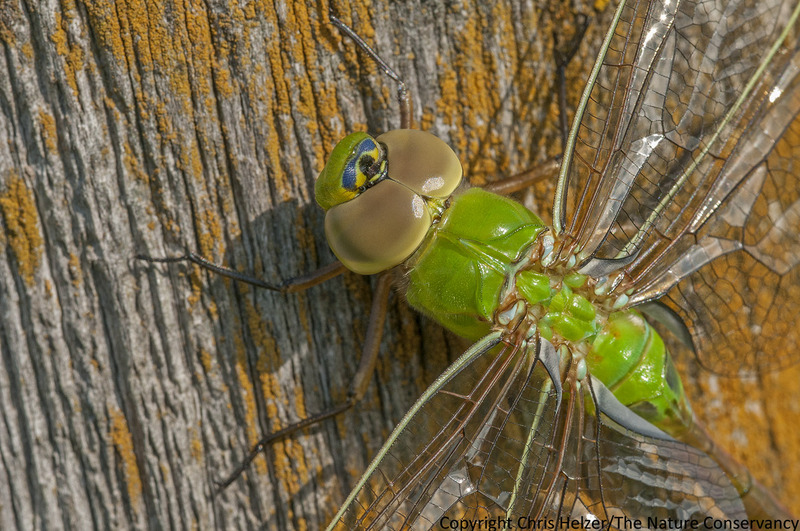 While I was too late to see the actual emergence of the damselflies, I did manage to find a green darner dragonfly that had just popped out of its larval skeleton and was fluttering its wings and waiting for its body to dry and harden. I snapped a few pictures of it in place and then carried it over to Anna so she could get a good look at it. 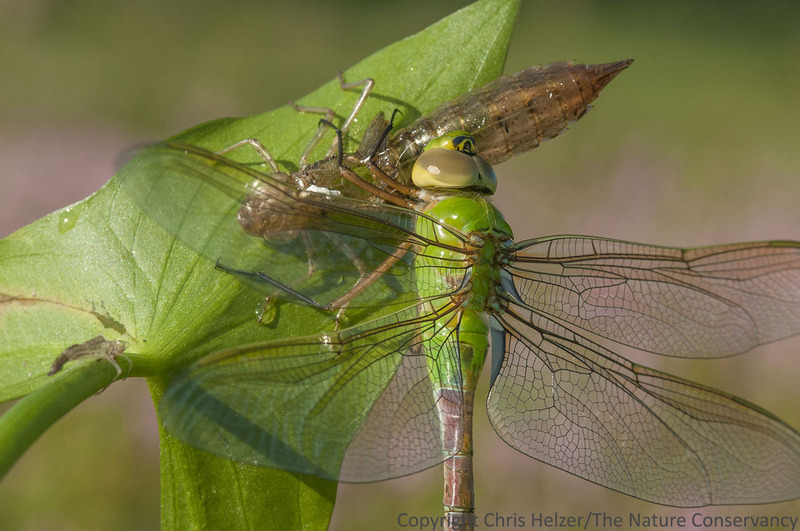 A green darner dragonfly and the larval exoskeleton it had only recently escaped from. 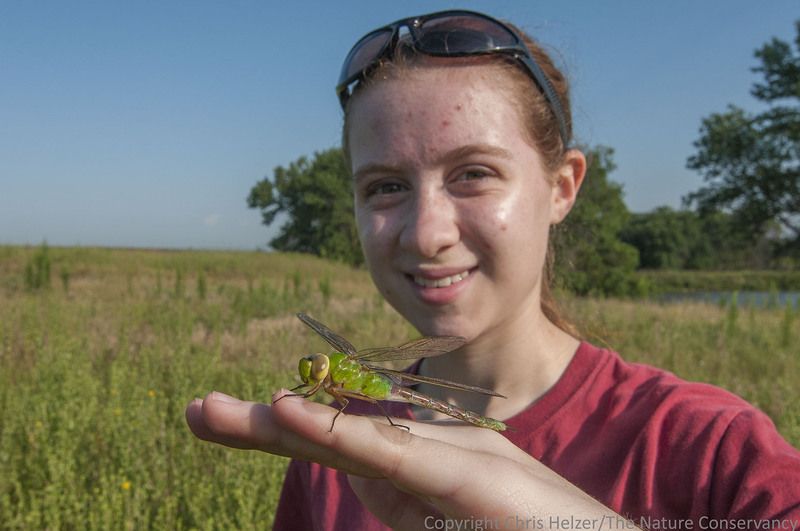 Anna enjoyed getting a close-up view of the dragonfly and even posed for a photo with it. 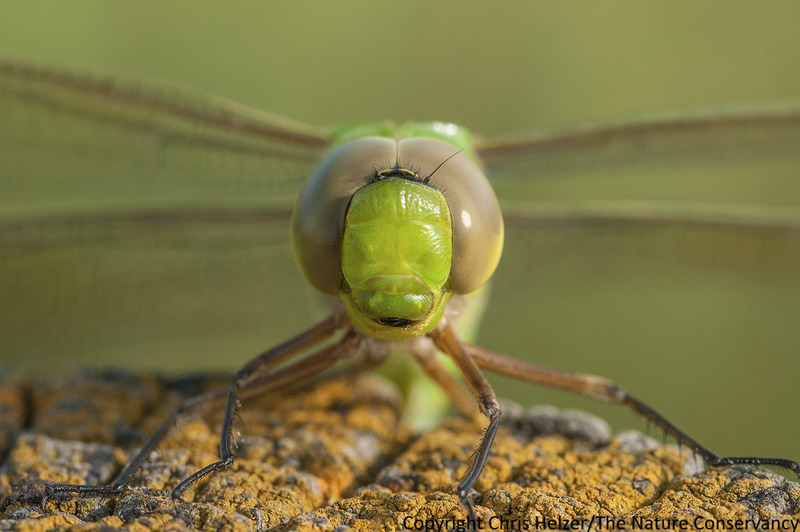 After we became a little better acquainted with the new dragonfly, we set it safely on a fence post so it could finish hardening up in the warm sun. I took a few more quick photos of it on the post and then left it alone. 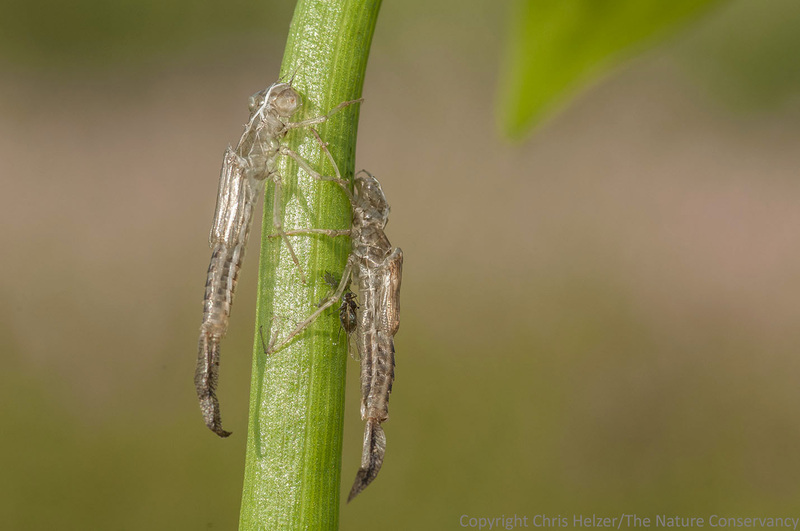 It was gratifying to see other dragonfly species zipping around nearby too – I’m hoping that’s a sign that a number of other aquatic invertebrates are also colonizing our recovering wetland. It should be fun to watch the changes in the coming years. Our new friend on the top of a fence post.